Students have 24/7 access to the course content and are not required to be online at a specific time, unless they wish to meet with their online teacher via phone on video chat. 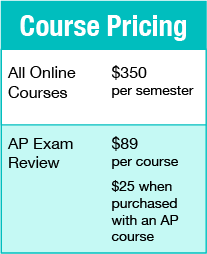 Plus, students can chat with an online tutor as part of the cost of the course. Live Tutor Chat is available Monday through Friday, 5 a.m. – 5 p.m. Pacific Time. Yes. With an average of 21 years of teaching experience — seven of those years online — ALVS teachers provide individualized expertise and engagement students can rely on. Teachers monitor each student’s progress to ensure the understanding of concepts, and continually guide students to improve important problem-solving and communication skills.